About two hundred years after the settlement of the Erzgebirge, from the fourteenth of the seventeenth century, the silver mines of the region began playing an important part in the economic and cultural life of he inhabitants of the area. When the mines of the region finally ran out of silver, however, the local workers were forced to undertake different occupations. The choice of what to do was obvious since the deep, thick forests of the are produced (and today continue to produce) a fine quality of wood for the Erzgebirge craftmen. 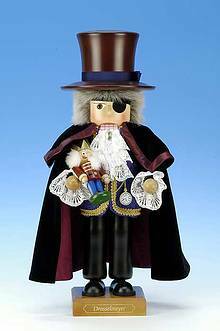 Today, the beautiful nutcrackers, carved incense burners, carved figures and Christmas angels and ornaments produced by the workmen of the Erzgebirge have become famous all over the world. How ironic. If the silver mines had not dried up in the seventeenth century, the industrious workers of the Erzgebirge would never have had to turn to woodcarving and collectors of fine hand carved wood would have been deprived of their work.